This document is provided as a tool to help the user understand the range of percent performance scores generated by the ESII Tool. This document will grow over time, as more users apply the ESII Tool and provide map unit photos and examples of the outputs generated for those map units. This document is provided for reference only. Definition: A measure of the ability of natural features to physically filter soil particles from air at or near the ground surface. Significant Descriptors/Attributes: narrow buffer width with little or no vegetation. Significant Descriptors/Attributes: three to seven ft. tall; dense herbaceous basal and aerial cover values; wide buffer width, low or no shrub or tree cover. Significant Descriptors/Attributes: mix of tall, deciduous and evergreen trees with high percent canopy cover; high percent aerial cover for shrubs (evergreen dominant strata scores higher than deciduous vegetation). Definition: A measure of the ability to help moderate extreme ambient air temperatures. The function focuses primarily on moderating high temperatures. Significant Descriptors/Attributes: Surfaces with low albedo (asphalt, concrete, etc. ); exposed surfaces (attributes that contribute to low evaporation and transpiration); low aerial vegetation cover; no water regime. Significant Descriptors/Attributes: Surfaces with moderate albedo (dark soil, evergreen, etc. ); exposed surfaces (attributes that contribute to moderate evaporation and transpiration); medium aerial vegetation cover, water regime. Significant Descriptors/Attributes: Surfaces with moderate albedo (trees, water, etc. ); exposed surfaces (attributes that contribute to high evaporation and transpiration); high aerial vegetation cover; tall trees; water regime. Definition: A measure of the degree to which forces acting upon a stream channel are balanced by geomorphic changes to that channel. Significant Descriptors/Attributes: unstable channel; coarse substrates; steep slope; wide OHW; shallow stream indicative of periodic high flows. Significant Descriptors/Attributes: medium to fine substrates; low slope; small OHW width and OHW height ratio, indicating more depth to the channel. Significant Descriptors/Attributes: stable channel; fine substrates; low slope; ratio of OHW width to OHW height closer to or greater than 1. Definition: A measure of the ability to remove nitrogen from the water cycle due to plant uptake, filtration of sediments, or gaseous volatilization. Significant Descriptors/Attributes: low basal ground cover in single strata; greater than 20% slopes; little or no area affected by a water regime; moderate to highly permeable soils (e.g. Soil Group A and high percentage of sand/low percentage of clay); small buffer width. Significant Descriptors/Attributes: moderate basal ground cover in more than one strata; low slope; seasonal or occasional inundation over most of the map unit; medium percent substrates with low permeability (clay and silt); moderate buffer width. Significant Descriptors/Attributes: high basal ground cover; Low slope; permanent inundation over most of the map unit; high percent substrates with low permeability (high clay and silt); large buffer width. Definition: A measure of the potential to lose water to the atmosphere (from open bodies of water, exposed soil, ground cover and canopy cover). Significant Descriptors/Attributes: little or no vegetation cover; no permanent water regime; high permeability. Significant Descriptors/Attributes: seasonally or permanently inundated/saturated; moderate vegetation canopy leading to increased interception; moderate to low soil permeability. Significant Descriptors/Attributes: seasonally or permanently inundated/saturated; little or no vegetation canopy with impervious surfaces contributing to high interception values. Definition: A measure of the ability of free-standing water on the ground surface to move vertically downward through the soil. Significant Descriptors/Attributes: impervious or compacted surfaces; no vegetation cover; no water regime. Significant Descriptors/Attributes: slight slope; moderately well drained; moderate percent microtopography; moderate basal ground cover. Significant Descriptors/Attributes: high percent litter/duff; little or no slope; high percent microtopography; well drained; high basal ground cover. Definition: A measure of the ability to capture and accumulate precipitation falling on foliage, stems, branches, organic litter and inorganic surfaces such as rock, pavement, structures, etc. This function is viewed in terms of the ability to make precipitation available for evaporation. 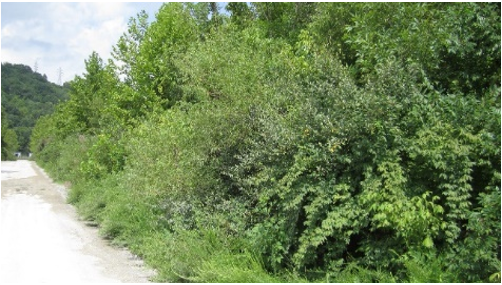 Significant Descriptors/Attributes:impervious or compacted surfaces with little vegetation; no microtopography; no litter/duff or stems/branches, etc. ; areas with permanent open water have 0% performance. Significant Descriptors/Attributes: semi-pervious or compacted surfaces; with little or no vegetation cover; no water regime. Significant Descriptors/Attributes: dense canopy cover; several canopy strata layers. Impervious or compacted surface with no vegetation (e.g. sidewalks, roads, building roof tops, etc.). Definition: A measure of the ability of a landscape to store nitrogen. Definition: A measure of the ability of the landscape to provide and mobilize sediment through aeolian or fluvial erosive processes. Significant Descriptors/Attributes: high percent man-made impervious surface; no vegetation; little or no exposed soil surface; no water regime. Significant Descriptors/Attributes: exposed soil surface; some soil disturbance; little or no vegetation cover; water regime seasonal or occasional inundation; flowing water; soils composed of smaller diameter components (high percent clay, silt, sand, etc.). Significant Descriptors/Attributes: high percent exposed soil surface or aquatic substrates; high percent soil disturbance; little or no vegetation cover; water regime seasonal or permanent inundation; flowing water; soils composed of smaller diameter components (high percent clay, silt, sand, etc.). Definition: A measure of the ability of soil to support the dynamic processes necessary to promote terrestrial plant growth. Significant Descriptors/Attributes: dominant soil substrates have little or no silt, clay or sand and high percent of impervious surface (e.g. man-made impervious or compacted soils); little or no vegetation (indicative of soil quality and contribution of organic material); little or no litter/duff; permanently inundated. Significant Descriptors/Attributes: minimal mix of clay, silt, and sand (provides basic soil medium); some vegetation over-story (indicative of soil quality and contribution of organic material); some litter/duff; seasonal or occasional inundation. Significant Descriptors/Attributes: Mix of clay, silt, and sand (one of the three is the dominant substrate); diverse Aerial Cover types (indicative of soil quality and contribution of organic material); deep litter/duff; no soil disturbance; seasonal or occasional inundation. Definition: A measure of the landscape’s ability to transfer soil moisture into the atmosphere as a function of photosynthesis. Significant Descriptors/Attributes: very low or no canopy cover; may be seasonally or occasionally saturated. Significant Descriptors/Attributes: limited canopy cover (at least one strata); seasonal or permanent inundation. Significant Descriptors/Attributes: diverse canopy strata assemblage (high canopy cover values trees, shrubs, and grasses); occasionally saturated or no water regime. Definition: A measure of the landscape’s ability to convey water from one location to another through overland transport. Significant Descriptors/Attributes: attributes that contribute to reduced mobility of water through the system, e.g. low percent slope; small hydraulic radius; substrates that contribute to greater roughness within the system (gravel, gravel/cobble, cobble, etc. ); aquatic vegetation; highly sinuous stream channel. Significant Descriptors/Attributes: low slope, medium hydraulic radius, substrates that contribute to less roughness within the system (silts, clays, sands, etc. ); aquatic vegetation; moderately sinuous stream channel. Significant Descriptors/Attributes: low to medium slope; medium to high hydraulic radius; substrates that contribute to less roughness within the system (silts, clays, sands, etc. ); aquatic vegetation, straight stream channel. Definition: A measure of the landscape’s ability to maintain cool surface water temperatures. Significant Descriptors/Attributes: not adjacent to, or within, 200 ft. of an aquatic map unit; no water regime; little or no vegetation; man-made impervious surface dominant. Significant Descriptors/Attributes: adjacent to, or within, 200 ft. of water; low vegetation aerial cover (distant map units may have higher vegetation cover (aerial and height) values); not directly south of an aquatic map unit. Significant Descriptors/Attributes: adjacent to, or within, 200 ft. of water; high vegetation cover values (distant map units require higher vegetation cover values); directly south of an aquatic map unit. Definition: A measure of a site or landscape’s potential to attenuate sound from anthropogenic sources as it travels across a site to a potential recipient. Significant Descriptors/Attributes: building with no natural attributes (no vegetation, on level with surrounding map units). Significant Descriptors/Attributes: some trees possible but open understory; open grassland with relatively tall vegetation; on same elevation as surrounding map units. Significant Descriptors/Attributes: tall tree dominant strata (evergreen scores better than deciduous) with dense understory; map unit is higher than surrounding/adjacent map unit. Definition: A measure of the landscape’s potential to obstruct a line of vision between man-made objects, buildings, or structures and likely off-site vantage points. Significant Descriptors/Attributes: some trees possible but open understory; open grassland with relatively tall vegetation; on level with surrounding map units. Significant Descriptors/Attributes: dense, tall vegetation with multiple strata; tall berms or hills can also score well; must be natural map unit; conifers are most effective. Definition: A measure of the landscape’s potential to improve air quality through the removal of airborne nitrogen. Significant Descriptors/Attributes: zero to thirty percent aerial tree cover. Significant Descriptors/Attributes: thirty to seventy percent aerial tree cover. Significant Descriptors/Attributes: seventy to one hundred percent aerial tree cover. Definition: A measure of the landscape’s potential to improve air quality through the removal of airborne particulate matter. Model Attributes: average summer high temperature, average summer mean temp., aquatic vegetation cover (emergent, floating mat), relative humidity, zolar radiation, water body type, water salinity, wind class, aerial cover (herbs, shrubs, trees), buffer width (distance across map unit parallel to fall-line), vegetation height, % surface (bedrock, boulders, clay, cobble, gravel/cobble, manmade impervious, manmade pervious, organics, rock, sand, silt, unknown), annual precipitation, average depth litter/duff, average growth period (days), basal ground cover (herbs, shrubs, trees), litter/duff area, critical bedform stress, dominant stand type, inundation type, slope, soil disturbance, total basal ground cover, total vegetative disturbance, water regime. Significant Descriptors/Attributes: high percent man-made impervious area; little or no vegetation cover. Significant Descriptors/Attributes: moderate vegetation cover values (basal and canopy cover); only 1 or 2 vegetation strata present; little to no exposed soil surface. Significant Descriptors/Attributes: robust, multi-layered canopy. Definition: A measure of the landscape’s potential to moderate heat extremes through shading, transpiration/ evaporation, albedo. Definition: A measure of the landscape's potential to uptake and store carbon compounds, both above ground and below ground, in vegetative structures and soil. Significant Descriptors/Attributes: little or no vegetation cover; no water regime; low permeability. Significant Descriptors/Attributes: moderate to limited canopy cover strata assemblage; often trees with small dbh; limited vegetation disturbance; water regime precluded by slope and/or low permeability (higher % clay). Significant Descriptors/Attributes: trees (medium to larger dbh indicative of mid-life stage life stage) and robust shrub strata layer; soils with medium distribution of percent sand, silt and clay capable of forming well-drained loam soils. Definition: A measure of the ability of the soils on a site to resist the forces of wind and water. Significant Descriptors/Attributes: low percent exposed soil surface; some soil disturbance; little or no vegetation cover; water regime seasonal or occasional inundation; flowing water; soils composed of smaller diameter components (high percent clay, silt, sand, etc.). Definition: Geomorphic process by which soil, sand, and rock move downslope typically as a mass, largely under the force of gravity, but frequently affected by water and water content. Function Performance: 0% and 9%, respectively. Significant Descriptors/Attributes: steep, long slope with minimal basal vegetation; some exposed soil surface area; soils that are seasonally saturated or inundated. Significant Descriptors/Attributes: steep, long slope with low basal vegetation cover; high vegetation disturbance; high percent exposed soil surface area; soils that are permanently or seasonally saturated or inundated. Definition: A measure of the landscape’s ability to maintain floodplain integrity. The service focuses on the protection of floodplain integrity through the presence of natural features that protect floodplain boundaries from erosion. Definition: A measure of the landscape’s potential to improve water quality through removal of dissolved or suspended nitrogen and moderation (cooling) of water temperature. In the ESII Tool outputs, this is reported as "Total (Water) Nitrogen". Significant Descriptors/Attributes: high basal ground cover; Low slope; inundation over most of the map unit; high percent substrates with low permeability (high clay and silt); large buffer width. Definition: A measure of the landscape’s potential to improve water quality through removal of dissolved or suspended contaminants and moderation (cooling) of water temperature. In the ESII Tool outputs, this is reported as "Water Filtration". Significant Descriptors/Attributes: high impermeability (e.g. man-made impervious) with little or no vegetation. Significant Descriptors/Attributes: moderate basal cover; slight slope; some porous soils surface (e.g. rip-rap). Significant Descriptors/Attributes: robust herbaceous cover; flat, high percent microtopography; dense basal cover; porous soils (i.e. high percent, sand, gravel, and/or cobble). Definition: A measure of the landscape’s potential to provide water necessary for use, storage, or discharge during the course of normal operations for a facility. Significant Descriptors/Attributes: little or no depressional area with >2’ depth, man-made surfaces, low percent canopy cover. Definition: A measure of the landscape’s ability of to adequately manage and convey a 25-year storm event. This service includes elements that predict both water storage and water transport potential.